While the bomb and gunfire attacks in Jakarta were continuing a picture emerged of a gunman on the streets. 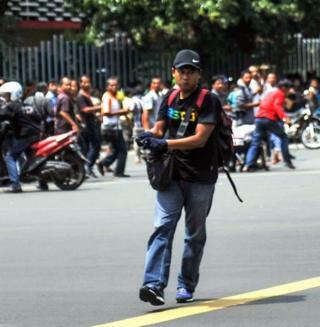 The photo, showing the man wearing blue jeans, black shirt, and baseball cap, carrying a gun and rucksack, was run by many Indonesian media outlets. It was widely shared online as well and he became the face of the terror that was gripping Jakarta. Now authorities have identified him as Afif Sunakim. He was among four attackers killed by police. Three civilians were killed and one died later of his wounds. More than 20 people were injured, including foreigners. National Police Chief, General Badrodin Haiti said they had identified the four attackers - they had initially thought there were five attackers but later revised the number. They are now hunting terror cells after the assault was claimed by so-called Islamic State (IS). Afif spent seven years in jail for attending a training boot camp for militants in Aceh, Gen Haiti said. Afif (also known as Sunakim), was captured by the police in 2010, Indonesian terrorism analyst, Solahudin, told BBC Indonesia's Ging Ginanjar. He was then sent to Cipinang prison in Jakarta. In that prison, according to Solahudin, Afif's ideology becoming more radical, especially when he met Aman Abdurrahman- a central figure connecting dozens of organisations aligned with IS in Indonesia. "Afif [was] freed from prison around August to September 2015. He was originally from Karawang, West Java," said Solahudin, author of the book The Roots of Terrorism in Indonesia. BBC Indonesia can confirm that though he was sentenced to seven years in prison, he was released early on parole, according to a source close to the anti-terror agency. Police said one of the other attackers was also a previously convicted militant.